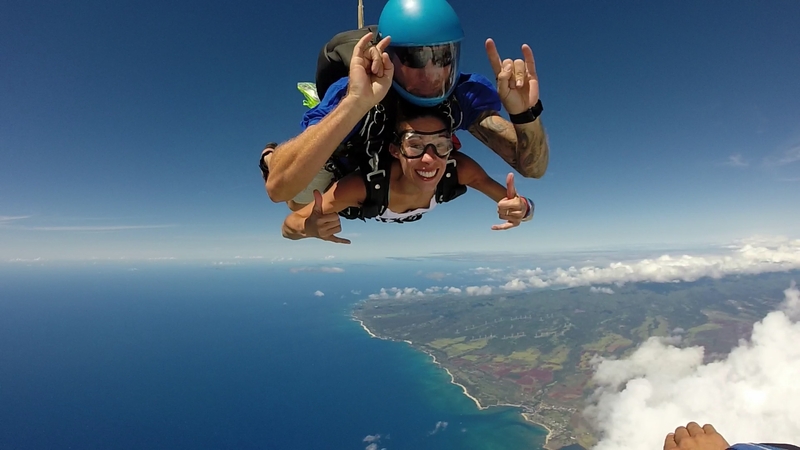 Skydiving in Hawaii – B00KS in Paradise! Okay so this is late, but after all this is my first blog post and I wanted it to be something interesting! 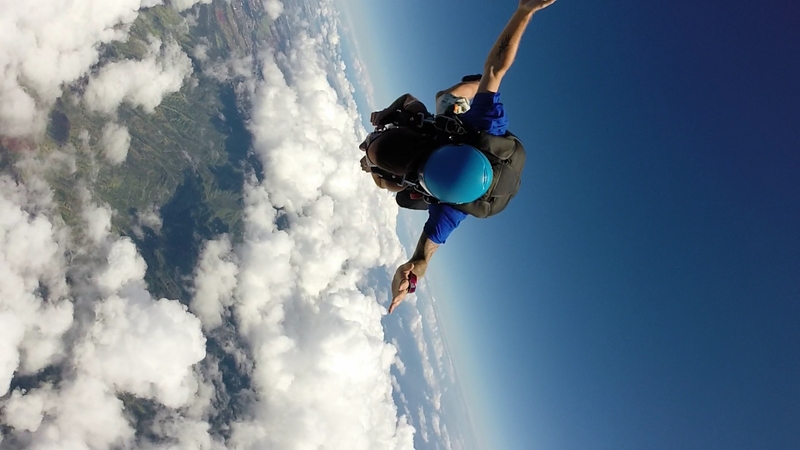 Last Sunday, June 1, 2014, I went skydiving! My roommate had two friends visiting from the mainland that wanted to go skydiving. They ended up inviting me, which was great because since I don’t have a car and the skydiving place is about an two hours away by bus, I probably would have never gone. So I have to thank those three wonderful ladies for inviting me for an experience of a life time! 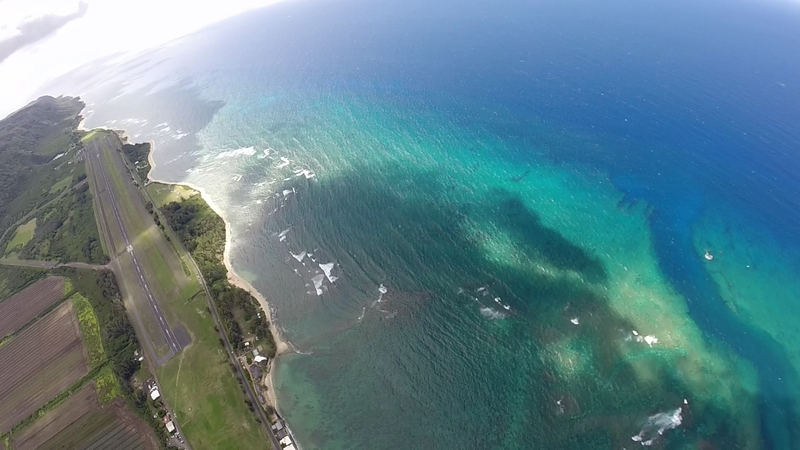 We had our reservation at Skydive Hawaii for 10:30am. We got there at ten when my other roommate realized that she had left her drivers license at home….not good considering you have to have your ID to prove that you’re over the age of 18. When we walked in we had to watch a video on how to land and what to do with yourself when you jumping out of the plane and blah blah blah. No one was even was even paying attention. After “watching” the video we had to fill out what seemed like mountains of paper work promising that we wouldn’t sue if anything tragic happened to us…not that I would even have the money to sue after this little adventure! It took about an hour for my roomie that forgot her ID to convince the people that she was actually 22! When she had finally done that we had to wait FOUR HOURS, even though our reservation was at 10:30!!!! I honestly think that they forgot to put our names on the list because we had gotten there before a ton of other people got there, and they all went before us. By the time it came around for our turn I was extremely irritated and hot (because the place has no shade really) and tired and just wanted to get it done with so I could go home! They had to split our group of five into two separate groups, one group of three and another group of two. I was a part of the group of two and we ended up going after the group of three. The instructor that I was harnessed to was awesome! He reminded me of Will Ferrell, both looks and personality. The only difference was this Will Ferrell had a tattoo sleeve, just like everyone else in Hawaii, and he had a prosthetic leg! I wasn’t really nervous when we were in the tiny tiny plane. I just wanted to do it. 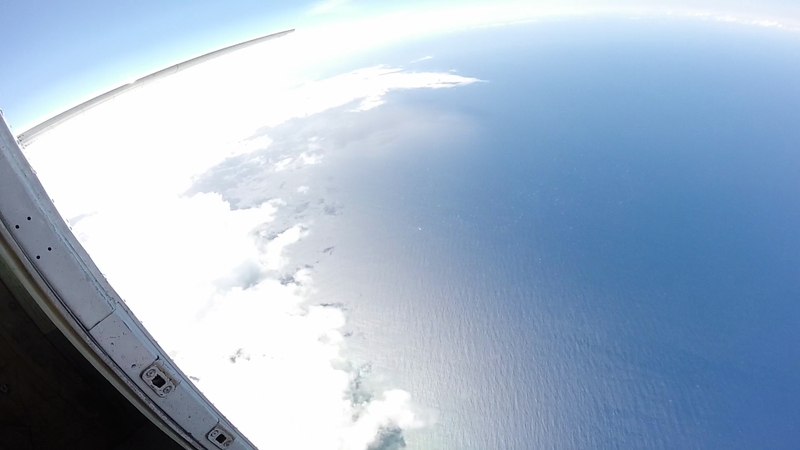 They had the door open to the plane the entire time so by the time we got to about 1500ft, which is the altitude at which we jumped, I was freezing! I was the first to jump out, along with Will Ferrell. It was an amazing feeling! The wind was whipping through my hair and we were falling so fast it was hard to keep my mouth shut. I knew we must have been falling really fast, yet it didn’t even feel like we were falling at all. If it wasn’t for the wind, it would have felt like we were floating. We fell for what seemed like forever, then Will pulled the cord for the parachute and it yanked us up so hard! Thought my harness was in my stomach after it! The view was absolutely amazing. The island looked so tiny. You could see both the south and north shore at the same time, then you realize it takes you an hour to reach north shore when coming from the south shore! My favorite part was the ocean. It was a deep blue characterized with the deeper water and as you went closer to shore the water turned a crystal clear blue. It was so clear you could see the coral reefs and the channels that carved through them. 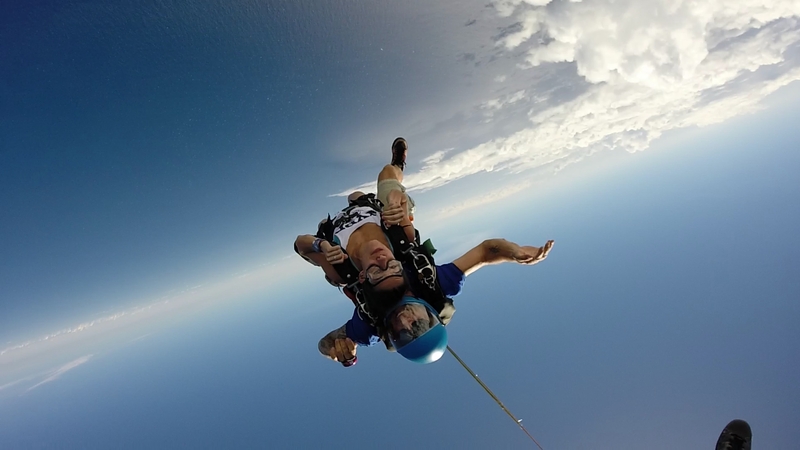 One of the reasons I loved skydiving was because of the view that you got of everything. You could see so much of the island all at the same time! 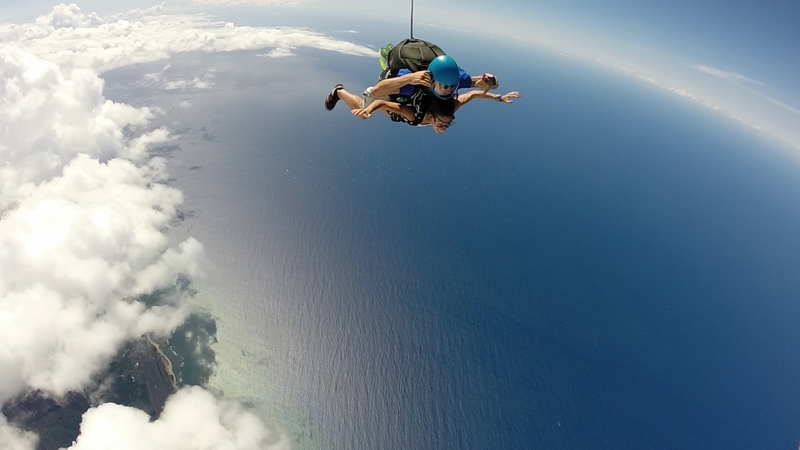 I would highly suggest going skydiving if you ever happen to visit Hawaii! The scariest part of the whole ordeal, I think, was landing. When we had gone up the trade winds had picked up making it very tricky to land. Also, it doesn’t help that you seem to be approaching the ground extremely fast! Some of the camera guys had fallen when landing when we were watching and waiting for our turn. The landing wasn’t as bad as I thought it would be, but we almost fall over since I’m a extremely clumsy person! I’ve attached some of the pictures (only the best ones of course!) below. 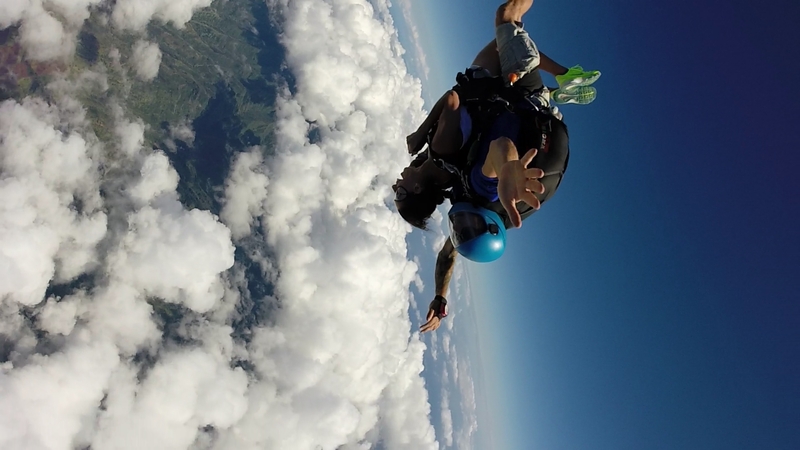 Hope you enjoy them as much as I enjoyed skydiving! 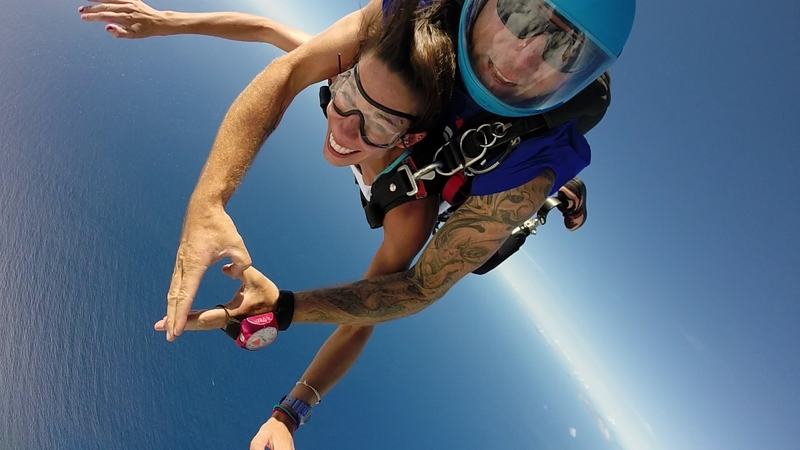 I am definitely going to try skydiving whenever I go vacation somewhere!!! 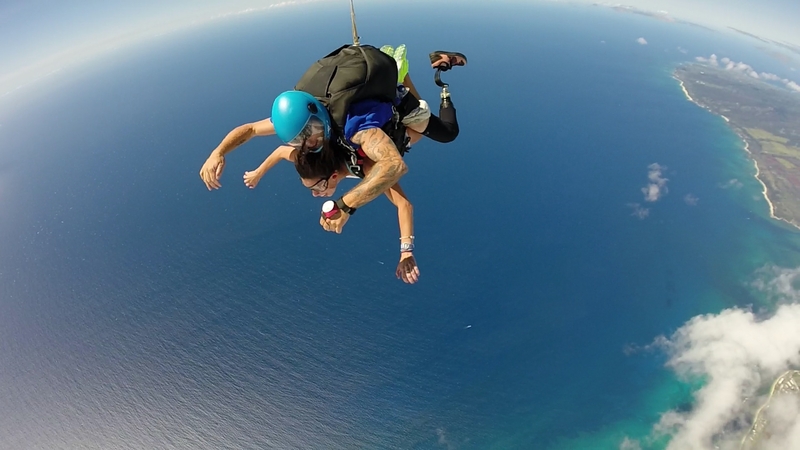 And if you ever visit Hawaii, you MUST go skydiving, just make sure you bring something productive to do while you wait!